Waiting for the next wave.. doesn't take long! Over the last couple of years, there’s been a lot of tempting footage of wave pools in the surf media, promising the dream of a perfect wave to surf over and over again. I was quietly curious about trying one out, but being up in the North East of Scotland I wasn’t keen on making the trip to our ‘local’ in North Wales. I figured if I was going that far, I’d just go somewhere with real waves..
Well, after a recent trip to Cornwall with a couple of days to spare, my girlfriend Tori and I decided to stop off at Surf Snowdonia on the way home to see what all the hype is about. It’s the perfect midway point for a trip to the South West of England from Cornwall, breaking up that long drive nicely. We arrived late at night and checked into our glamping pod. The whole thing was booked very last minute so we didn’t have a chance to look for other accommodation, but I’m sure there are plenty of options available. The pods suited us perfectly though, with everything we needed; right in front of the wave pool, with mattresses to sleep 4, electricity, underfloor heating (which we definitely didn’t need on this trip) and a bench and seating outside. You have to bring your own bedding, which we didn’t, but fortunately I had an old sleeping bag in the car which did the trick. The toilet and shower block is at the end of the row of pods, and you can use Wi-Fi in the main building if needed. We were knackered from a week of Cornish beach breaks and long drives though, so we went straight to sleep after a late night feast.. for us and the midges. So if you fancy a stay in one of the pods, bring midge repellent, and don’t forget bedding! A front row seat to the shred show. It’s a tranquil location, between mountains covered in trees and the wave pool’s still water. I woke up the next morning after a refreshing sleep, excited to see the wave working. We popped over to the main building, had the full breakfast which is included in each night’s pod stay, and waited for the wave pool’s start at 10 am. After breakfast, we headed back over to the pod and watched the first session getting underway. It is an impressive piece of engineering. The pool is split down the middle by a long hollow fence, and the wave is formed by a concrete block running back and forth inside the fence. There are three surfers on each side of the pool, taking turns going left and right as the block goes back and forth. This way, you get a short rest between waves. I watched the surfers in the first session, two of which were getting a lot of waves and surfing really well, both on shortboard shapes with a bit of volume. There was another guy on a high-performance shortboard who wasn’t getting into any waves, which definitely started my nerves tingling. It’s a strange environment to surf in, and as the time went on I became more and more aware of the audience. Surf Snowdonia is open to spectators for free, and there were plenty of onlookers in the stunning weather, never mind the lifeguards, waiting surfers, and photographers along the sides of the pool. I could feel the same knot I get in my stomach that I get before paddling out to surf waves I haven’t before, or waves a bit too big for my comfort zone. I imagined a full session of frustration as I failed to catch wave upon wave.. But Tori was up first on the intermediate wave, so I got over myself to cheer her on and take some shots of her shredding! You can see the block and fence that makes the waves in the background of this shot. The intermediate wave is formed from the same wave as the advanced wave but caught from the middle of the pool as the wave pushes outwards from the fence. It looked like a blast, especially on the foamies provided, and Tori caught a few little dreamers! I’d seen plenty of waves missed as I watched throughout the day and determined not to miss my first one, I paddled far too early. It’s hard to judge when to paddle as when you’re next to the fence and the block starts moving, it doesn’t look like a proper wave until it’s almost on you. It is a totally different experience from being in the sea. I still caught it though, but was too far inside and got stuck behind the section. After the first one though, my nerves calmed and things got better from then on. I did miss a couple of waves as I dialled in my positioning, but that would be expected at any new spot you were surfing anyway! I found the trick was to paddle right next to the fence at all costs, as when you catch it you are immediately pushed away from the fence and then counterintuitively, surf back towards it. There are also some weird currents to contend with while you are waiting for your wave, and on most waves I felt myself being sucked towards or away from the fence. I took to holding the fence with a hand or toe to stay in position, which worked perfectly. Stay close to the fence! 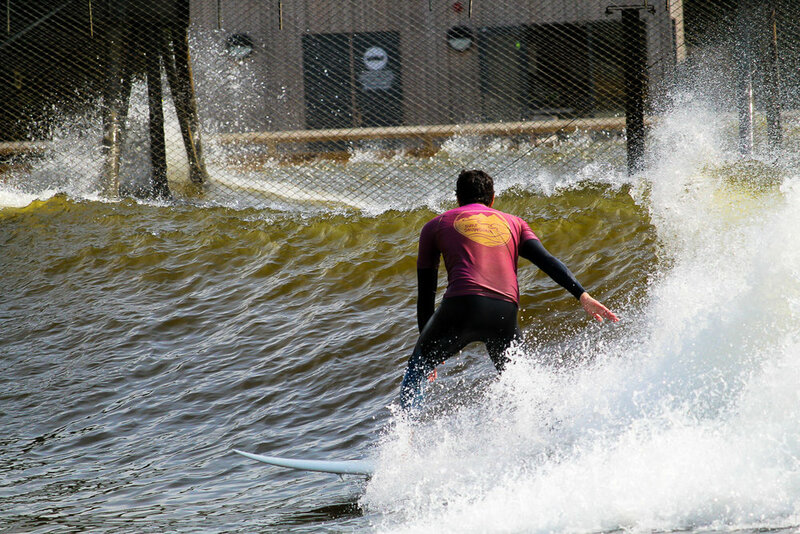 Surfing back towards the fence feels quite counter-intuitive as you watch the wave coming towards you. A session lasts an hour, costs £40, and you get about 14 waves. You catch a wave roughly every four and a half minutes, which works out at about £3 per wave.. you definitely need to make the most of the waves you get! They come like clockwork and your wave comes around rapidly. Paddling back and forth to the fence soon gets tiring, but there is no sitting out back for a breather. You have to go, you’re paying good money for the privilege! I got a few good ones and was really beginning to enjoy myself by the time the session ended. I felt like a second session would be worth it, and immediately booked another for a couple of hours later, justifying to Tori that we weren’t likely to be in North Wales again anytime soon.. she didn’t mind! The sun had been beating down all day and there were quite a few folks out surfing in boardshorts as the water heated up. I didn’t have any, and could only watch in envy as I roasted in my 3/2mm wetsuit. All nerves banished though, I was only excited to get back in the water for my second session and cool down. When you’re on one side of the pool, there is always another surfer on the other side of the fence getting waves on their side of the pool. The guy I ended up rotating around with for the second session told me he was a local who had learnt to surf at the pool! He had only surfed in the sea a couple of times, but he was surfing well, which definitely surprised me. I guess the sea is not a necessity for learning to surf.. I didn’t miss a wave for the entire second session and by the end I was taking more risks and pushing my average turns farther than usual (almost to 11 o'clock!) I even got an extra wave from the lifeguard at the end, which was a fitting end to a memorable session and trip. So, would I come again? In short, definitely. It’s a bit too far and a bit too expensive for me to come to Surf Snowdonia solely for an extended surf trip, but the area around North Wales is filled with other outdoorsy things to do. As a general trip to the area, I’d definitely come back. And you wouldn’t have to drag me back for a few waves! It’s located in an ideal location for a short stop on the way to or from Cornwall or Devon, so it’s worth factoring it into a trip plan or having it as a backup if you get skunked. The staff were all friendly, helpful, and were more than happy to offer pointers for positioning as I dialled it in. I’d expect nothing less though, they get to surf it every day! 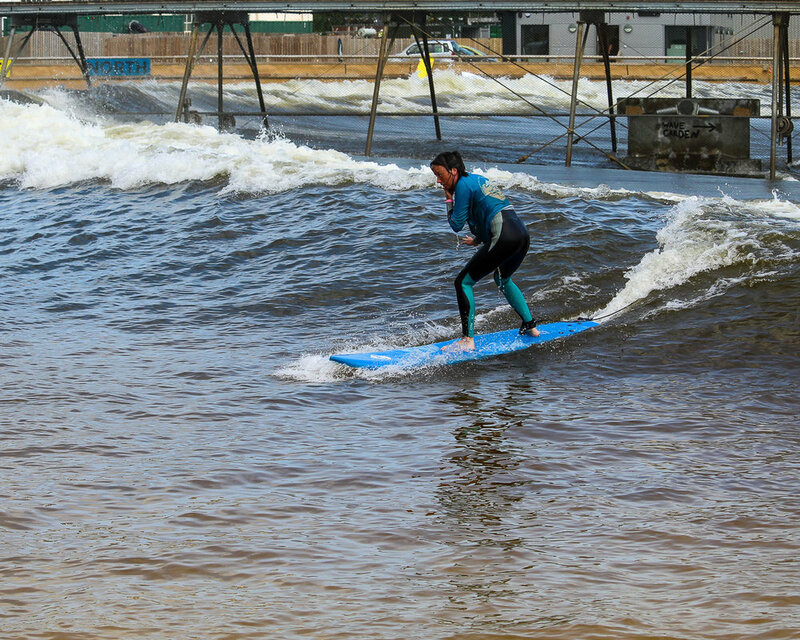 Check out Surf Snowdonia for more info!